Strong, compact, lightweight and forceful, this 20V cordless impact wrench crams into tight spaces and delivers a hearty 1800 inch lbs. of torque. At just 3.4 lbs., DeWalt gives you the ability to deftly handle the tool for a variety of fastening jobs. When visibility diminishes, ignite three front-facing LED lights to shine on your work space with a 20-second shutdown delay. And, socket retention is bolstered on this device with a 1/2-inch detent pin anvil. DeWalt's 20V MAX Lithium-Ion 1/2-inch High Torque Impact Wrench with Detent Pin Anvil is designed for mechanical contractors, plumbers, automotive users, maintenance and repair professionals as well as remodelers, that demand a tool for difficult fastening applications, like driving and removing fasteners, nuts and bolts in wood, metal and concrete. The impact wrench delivers 300 ft. lbs. of torque and features a variable speed trigger with an electric brake for added control. This tool also provides 1,500 revolutions per minute (RPM) and 2,300 impacts per minute (IPM) for powerful application speeds. 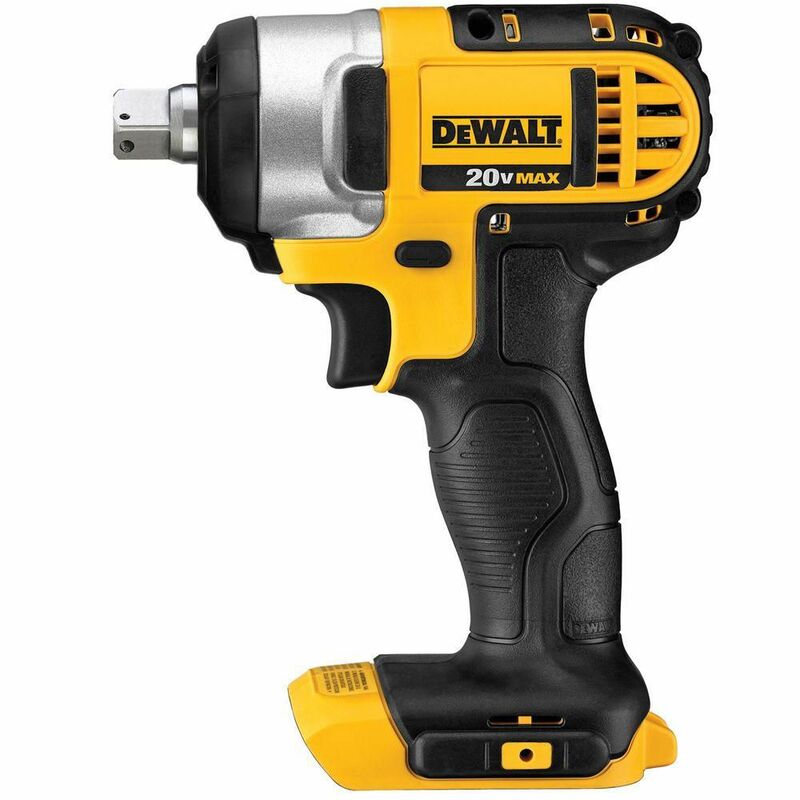 20V MAX Lithium-Ion Cordless 1/2-inch Impact Wrench with Detent Pin (Tool Only) Strong, compact, lightweight and forceful, this 20V cordless impact wrench crams into tight spaces and delivers a hearty 1800 inch lbs. of torque. At just 3.4 lbs., DeWalt gives you the ability to deftly handle the tool for a variety of fastening jobs. When visibility diminishes, ignite three front-facing LED lights to shine on your work space with a 20-second shutdown delay. And, socket retention is bolstered on this device with a 1/2-inch detent pin anvil. 20V MAX Lithium-Ion Cordless 1/2-inch Impact Wrench with Detent Pin (Tool Only) is rated 4.4 out of 5 by 78. Rated 2 out of 5 by ColonelSanders from Bought this impact gun to get away from using my... Bought this impact gun to get away from using my compressor. Unfortunately that was a big mistake and waste of money. On a full charge this couldn’t even take off lug nuts. Rated 5 out of 5 by Rick from I’m more than satisfied with the power that this cordless... I’m more than satisfied with the power that this cordless impact has. It travels with me in case of a flat tire and its come in handy for repairs during working hours. Rated 5 out of 5 by Chas1 from A good product. A good product. Rated 5 out of 5 by Ro from Never knew I needed this tool before.Thought breaker bar would... Never knew I needed this tool before.Thought breaker bar would suffice for my power equipment/auto maintenance, but this proved me wrong.It’s a keeper. Rated 5 out of 5 by Jwfixer from Great for tight spaces. Front end etc. Great for tight spaces. Front end etc. Rated 1 out of 5 by Rick from It didn’t have the power to remove the bolts I... It didn’t have the power to remove the bolts I had bought it for. I returned it to the store and purchased a better one. brushed or brushless? description contradicts itself it says: Brushed/Brushless	Brushed Motor	Brushless You really should make up Your mind! The DCF880B has a brushed motor.